This unique Himalayan Bio-Energy retreat will help you enhance your physical, mental, emotional and spiritual health. You will learn how to reconnect with your true self, discover how powerful is the energy of sun, air, earth and water and how you can recharge yourself, from the unlimited source of Universal Energy. Maa Asho Institute's professional, spiritual and very charismatic Masters will teach you how to feel your own aura (energy body) and make it stronger, how to balance your mind, body and soul, how to clean and reconnect with your energy centres Chakras. In this non-religious course, that accepts students of all religions, you will learn how to sustain the energetic and healthy state. You will be accommodated in the Sood Family's Heritage Retreat house, in the heart of Pragpur. This traditional house has a very long history; Master Healer Hardesh grew up here with his nine brothers and sisters. This house has a very special energy. It combines traditional Indian architectural design and modern facilities, for the western guests. The family house has been completely renovated in February 2017. The floors and walls are made out of special local clay, that keeps the house cool inside even during hot summers. The natural floor is also very good for meditation, it provides better connection with Mother Earth. Every room has fans and mosquito nets. The house offers 3 guest-rooms that can accommodate a total of 8 guests: two double rooms, with twin queen beds and en-suite bathrooms and a quadruple room, with 4 individual beds and a bathroom, located one floor below. Maa Asho healing center is situated in the heritage village Pragpur, Himachal Pradesh, India. The institute was established by Master Hardesh and Supriti (former Science Consultant). 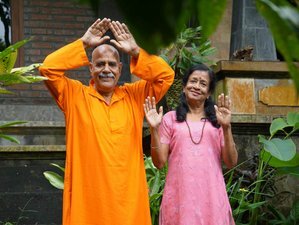 Master Hardesh and Supriti have been teaching since 1972, after graduating in Biology and Education. To date, they have taught more than 10,000 students in different fields of education, including Yoga, Dhayana (Meditation) and healing with Bio-energy. Their teaching is based on Vedic sciences and the latest research from esoteric sciences. Healing techniques are pre-tested on thousands of patients, you only need to learn and apply them, without any side effects. Maa Asho Institute has trained healers from 53 countries, who are using Pranayog healing techniques, from ancient India, for either healing themselves or professionally healing others. Upon completion of the course, you will be provided with a legal Professional Certificate. Note: if you are arriving from a different location in India, you can come directly to Pragpur Heritage Retreat Center and check in from 12:00 p.m. onward. Born in Port Blair, Andeman and Nicobar islands, she did her Masters degree in Zoology and Bachelors degree in education. She is teaching since 1973. She worked as a Principal in senior Secondary school, Dairy Farm Port Blair and took voluntary retirement in 1997. Since then, she has devoted her life in conducting healing courses and giving healing for various ailments. She has the power of clairvoyant and has specialized in the treatment of karmic and inherited and acquired physiological problems. Born in Dharamshala, he did his Masters degree in Zoology and Masters in education. He is teaching since 1973. He is doing yoga meditation since he was in school. He took voluntary retirement from Govt. job (Science consultant in science Technology) in 1997, from port Blair (Andaman Nicobar Island) and since then he has devoted his life for the welfare of mankind, by offering free healing and professional courses in Pranayog healing and chakra meditation. He is trying to spread the Pranayog healing around the world. He has already conducted healing and meditation courses in India and USA. This bio-energy course takes place is a very special venue - Pragpur village. Pragpur is situated in Kangra district of Himachal Pradesh, which has a very big Tibetan influence from Himalaya. Pragpur was founded in the late 16th century, by the Sood's dynasty, in memory of Princess Prag Dei of the Jaswan Royal family. This region of India has one of the most beautiful nature, landscapes and clean drinking water. The master-healers who lead this course, Supriti and Hardesh, are descendants from the famous Sood dynasty, and together with other villagers, they preserved this precious culture and all traditions over the centuries. That is why Pragpur has officially been nominated as a "Heritage Village" by the State Government. During the course, you will be served with special home-cooked Indian meals. Locally grown and fresh vegetarian products are prepared, daily, for you. You will enjoy a very healthy variety of beans, cereals, fruits, vegetables, herbs and spices. Hardesh and Supriti are also specialists in herbs medicine and, during the meals, they explain the purpose and benefit of every growing plant and seed! Please note that the Maa Asho Institute does not provide internet facilities, as their aim is to connect you with yourself, as well as with nature, peace and meditation. If you believe it is imperative for you to have internet connection, you can always buy a sim card, with a mobile data package, from the shops in the village. Please book your flight to arrive at Indira Gandhi International Airport, Delhi (DEL). You may continue with a domestic flight to Gaggal Airport, Dharamsala (DHM). There are 3-4 flights daily, operated by Spice Jet, Air India and Hahn Air. From the Dharamsala airport, you may benefit from the transfer organized by Maa Asho Institute, every Friday, at 16:00, which is included in the price package and which will take you directly to the Pragpur Village Healing Center. Maa Asho Institute offers courses in healing with Prana (vital energy) in order to heal yourself and become a professional energy healer. Receive a special discount of 10% for the availability on August. Please note that the minimum number of guests per retreat is 4. Admission to the retreat will be closed 1 month before the announced date.